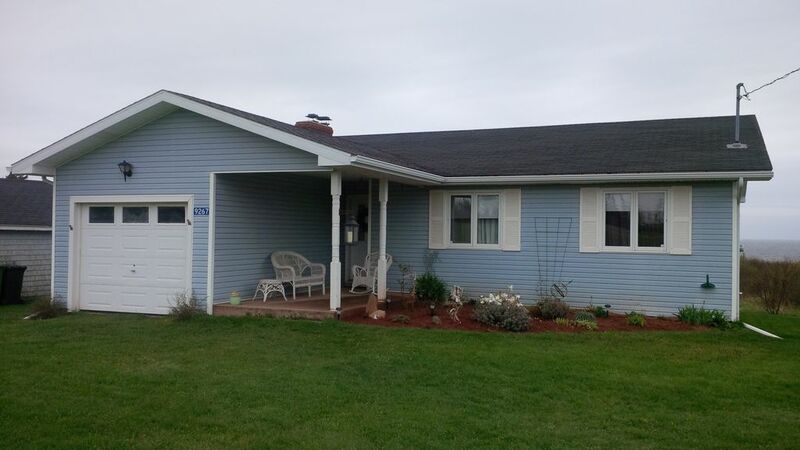 Beautiful oceanfront home with 3 bedrooms, 1 bathroom with attached garage on 3 acres of land. Comes fully equipped with fridge, stove, washer and dryer, and high speed internet. Living room has wood burning fireplace and views of the Northumberland Strait. Enjoy the sunset from the comfort of the large attached outdoor screen room and patio. Beautiful sunsets and views of the lobster fishery all summer long. Red sandy beach just 1 km down the road. Just 25 minutes from North Cape Windmills and Lighthouse, West Point Lighthouse Beach and Jacques Cartier Provincial Park. Just 15 minutes from renowned Mill River golf course featured on Big Break Canada and the villages Alberton, O'Leary and Bloomfield. Here is a picture of the house from Google Maps street view. It gives you a better picture of the property as a whole. Melissa and I live for love, passion and adventure. Our numerous travel adventures have brought us to quite a few different places. We fell in love with Prince Edward Island during a trip to the island to celebrate our first wedding anniversary. Three months later we had our house sold and the car packed and we made the move to PEI. We have not looked back since. Bathroom includes toilet, sink, tub and shower. Towels included. Beautiful West views of the Northumberland Strait. Stunning sunsets can be seen year round! Free use of the washing machine is included. Fully equipped kitchen with plates, cutlery and glass ware. Pot & pans, coffee maker and kettle. Large harvest table with seating for 6 people. Our old collection of DVDs and use of the Netflix account are available for your viewing pleasure. Covered screened in patio dining/sitting area with patio furniture. Second open-air patio area with patio furniture. This is a lovely spot on the west shores of the island, with a magnificent view of the ocean. Poison Ivy rampant on the path to the bluff prevented us from crossing the foot bridge to get a closer look. With the hot sunny weather, we spent much of our time on the great screened in porch at the back of the house, with an ocean view. The mosquitoes found every hole and rip in the screens by early evening, but a lovely breeze blew in through the dining room windows. A few cushions for the wicker deck chairs might be comfortable too. Beds were very comfortable, but plastic mattress covers made them a bit warmer than necessary. The kitchen for the most part was adequately equipped, but the "Dollar Store" cutlery and luncheon size forks could be improved on. We never did figure out how to use the oven and one burner on the stove is a little temperamental. The bottom of several of the pots is getting very thin and a spatula, salad servers and ladle would be handy. No amount of scented candles or Glade can replace a good thorough cleaning. This beautiful location could indeed be a Home Away from home, with a bit of TLC. It was a treat to watch the lobster boats out on the water and a perfect location to join in West Cape reunion activities. You definitely need to warn guests about the poison ivy because sensitivity to this plant can be nil to severe. the home has all you need and the owner is a very very nice person . He was there for all our questions and needs thanks Luc I would love to stay there in the winter for sure the property is very secluded and comportable and we didn't need anything but food. I will be looking to stay next year for sure.10 stars from us to you thanks again. The house was lovely. The grass could have been cut and gardens weeded. A most beautiful spot! Very comfortable, plenty of room, easy to get to, and near the beach. A great 3BR home with all the comforts including a screened in porch. Beautiful ocean view sunsets. Nearby beach provides great swimming, shell and sea glass gathering and plain 'ol r&r. Cycling the Confederation Trail was a highlight and we were happy we had rented bikes in Charlottetown when we were there. Very friendly area with Bloomfield only 10 minutes away. You ever wish you can sit and unwind and enjoy amenities of home but not busy life. This was a perfect romantic get away for myself and partner. We are looking at going again sometime soon and maybe bring kids... The cottage has everything you can possibly need. Amazing views and great place to visit. Luc and Melissa were there fo any questions and very helpful. Beautiful sunsets and views of the lobster fishery all summer long. Red sandy beach just 1 km down the road. Just 25 minutes from North Cape Windmills and Lighthouse, West Point Lighthouse Beach and Jacques Cartier Provincial Park. Just 15 minutes from renowned Mill River golf course featured on Big Break Canada and the villages Alberton, O'Leary and Bloomfield.